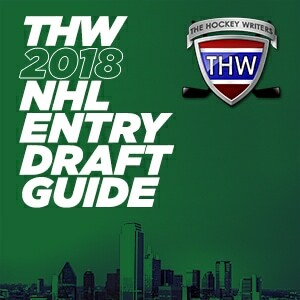 Every National Hockey League draft class has a few sleeper picks in it. Sleepers are players that may not have garnered a ton of attention during their draft year, but have a few traits that suggest they could break out. 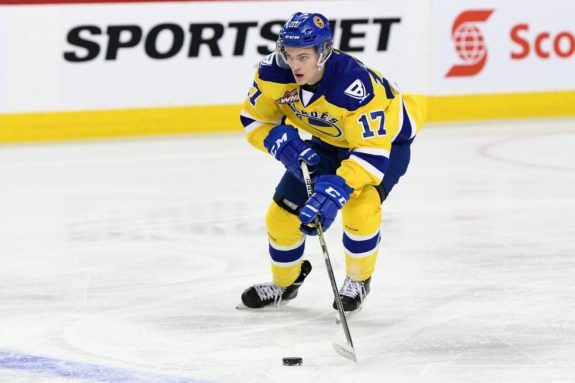 Saskatoon Blades forward Eric Florchuk finished the 2017-18 season as the 110th-ranked North American skater by the Central Scouting, but he could end up being a superb value pick. Florchuk was originally drafted into the WHL by the Victoria Royals and had a solid rookie season in 2016-17 as he put up 9 points over 51 games. He began this past season with the Royals, but was traded after amassing 28 points in 43 games as the Royals hedged their bets regarding a potential playoff run – the trade netted them a pair of first round draft picks. He ended up with the Blades, where he had 21 points in 28 games following the trade in a larger role than he had with Victoria. He’s a versatile forward, being able to play on the wing or up the middle effectively – though he’s a little bit better at creating offense consistently playing on the wing. The worst thing you can say about Florchuk is that he’s not exceptional at anything. The best thing you can say about Florchuk is that his game lacks big holes. He’s effective in all three zones and is equally adept at generating offense as he is at negating the other team’s attackers. If there are areas where Florchuk needs to improve to be a successful pro, they’re his consistency and his physicality. He went through a few long cold stretches offensively and overall had 37 games without a point – making his impressive production a product of effectively half of his season. If he can harness that offensive talent over a full season, he’ll be very potent. He needs to bulk up a bit and protect the puck better with his body, but those parts of his game may improve as he matures. Florchuk is the type of player that coaches love because he’s not bad at anything, meaning that he can be trusted to be thrown onto the ice in virtually any situation. While he’s not a perfect player, his reliability means he’ll get tons of opportunities to round out his game and augment his skill-set. Florchuk likely won’t go particularly early in the 2018 NHL Draft, but he’s a good bet to progress significantly in his post-draft seasons. Florchuk seems likely to be taken somewhere between the fourth and sixth rounds. Eric Florchuk has been impressive. Long efficient stride creates deceptive speed. Staal-esque. Conscious and committed defender. Florchuk projects as a third line forward, either on the wing or at center. Florchuk represented Canada at the World Under-17 Challenge, capturing a silver medal.